"The year is 50 B.C. and Gaul is entirely occupied by Romans. Well, not entirely. One small village of indomitable Gauls still holds out against the invaders. And life is not easy for the Roman legionaries who garrison the fortified camps of Totorum, Aquarium, Laudanum and Compendium..." By Toutatis! What is the secret of the invincible Gauls in their sleepy little village? How have they managed to defy Roman rule for so long? The secret of course is the mysterious magic potion brewed by their venerable druid Getafix that gives them super strength and enables them to bash Roman soldiers by the hundreds. The Gauls might be near invulnerable with their potion but they are a superstitious bunch and greatly fear the day when the sky might fall on their heads. 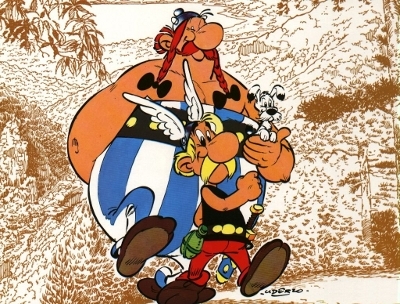 How wonderful to discover that the people at Eon are Asterix fans and have themed their new film and its theme song around the famous French comic book series. "When the sky faaaaws... it cumbles...." What? What's with the strange phrasing? I have to be honest and admit I didn't really know who Adele was until I heard she was under consideration to do the theme. It shows how very plugged into popular culture I am. I may as well live in a cabin on the moon. The good news is that the song is a considerable improvement on the previous two. For my money Casino Royale and - especially - Quantum of Solace have the two worst theme songs in the series because they don't even sound like Bond songs (you could say Die Another Day didn't sound like a Bond song but for reasons that sometimes escape me I enjoyed that one more than most people) but Skyfall is acceptable. It sounds more like a Bond song and despite being too obvious and slightly bland it's fine for what it is. It's along the lines of the Tomorrow Never Dies and The World Is Not Enough songs. Not very exciting or memorable but ok. Decent enough. I think someone obviously listened to the criticism of the last song and was sensible enough not to run the risk of another Jack White (or whatever his name is) debacle. Daniel Craig's awful Unhygienix the fishmonger "Bond" is never going to be my cup of tea but at least the song this time is bearable.